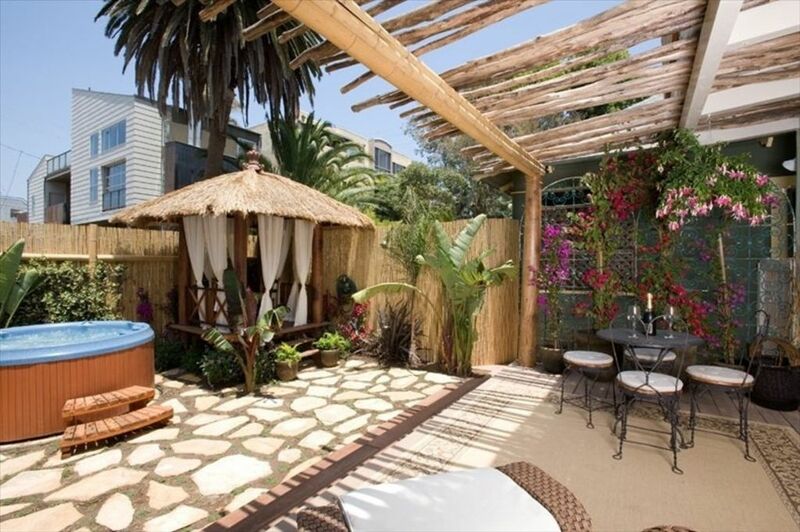 Imagine staying in a airy, bright, French country style cottage situated in a lush tropical garden only 1/2 block away from wonderful Venice Beach. Our 2 bedroom 1 bath Breeze Cottage has been completely remodeled by a local LA interior/production designer, who has years of experience in film & television, and has created a one-of-a-kind vacation rental. All the rooms exude the peace and tranquility of a French country resort. You know you’re going somewhere special as you enter the bamboo fenced yard that surrounds The Breeze Cottage. You enter to find a luscious front yard with 4 person Jacuzzi next to a hand crafted grass and teak hut where you can lounge away the afternoons in the shade. The large deck with two wicker club chairs is perfect for relaxing in the sun, and are next to a bistro table for outdoor dining. There’s even an outdoor shower to wash off your sandy toes when you come home from the beach. The main area of the Breeze Cottage is open and airy with a fully-equipped kitchen overlooking the dining and living room. They are separated from the front yard and deck by wall to wall sliding glass doors creating a seamless indoor/outdoor experience. It is perfect for watching little ones play outdoors or simply enjoying the scenery of the lush garden. The new custom kitchen has bead board cupboards, new stainless steel appliances and a farmhouse sink. The living area has a comfortable oversized sofa (with queen fold-out bed), 42” flat screen HDTV, BlueRay DVD player, CD player, and cable. The dining area has seating for 6. You can add the bistro table to serve 8. The entire unit has hardwood floors throughout with unique furnishings from around the world. All of the closet doors are of distressed wood imported from India, they full of charm and character. The furnishings are reminiscent of a cottage in the South of France. The charming master bedroom has a comfortable king size bed with gorgeous wood headboard and a flat screen HDTV equipped with cable. The second bedroom is quaint with a antique wrought iron head board and cozy queen size bed. There is a comfortable sleeper queen-size sofa in the living room. The Breeze Cottage has one parking space, a full sized washer and dryer, Wi-Fi, plus heating & air conditioning. Need more room? There is a option to conjoin the Breeze Cottage with our Le Petite Studio. Adjacent to the Breeze Cottage is a delightful studio apartment with its own kitchenette, bath & quaint patio. The studio also has a flat screen HDTV, BlueRay DVD player and cable. The charming bathroom boasts a wonderful, restored antique claw foot tub. The bed can be made up as a king or 2 extra-long twins, your choice. Sleeps 2 very comfortably. One parking space comes with the unit as well. If you are interested in adding the extra room please inquire. One secure parking spot directly behind property. First of all, do not let the name of this apartment unit confuse you. It is not a cottage, it is an apartment with adjoining rooms and paper thin walls. Hot tub was not usable. We told Bernadette on day one that it smelled bad and her assistant via text message the following day. They did call to have a service man to come out to clean it on day three. Once you can use the hot tub expect the upstairs residents to watch you out their window the whole time. Also, my husband had to fix the toilet because it took 5 minutes and multiple attempts to flush. Do not play an acoustic guitar in the living room after 9:00 pm or Byrnadette will call you with noise complaints, threaten to call the police, threaten eviction, and threaten to keep your $1000 deposit. Byrnadette will also verbally abuse you calling you names, calling you a pot smoker, and that you are hallucinating. This is all not true. She also said that there were 5 guests at the apartment when there were only 2. So we got charged an additional $125 for extra guests before we even arrived. There were only two people in a unit advertised of sleeping 8 people. Read the lease agreement carefully. Byrnadette will also take your deposit if your kids make too much noise playing. I wrote a 25 page formal complaint letter to Home Away about the harassing management with documentation about the verbal abuse and name calling. My husband left the apartment and got a hotel and loved the rest of his vacation. Before responding to this review, I would like to share a thread of text messages sent to my assistant by Amy’s supposed husband, Todd after I brought up some noise complaints from fellow neighbors. I’m hoping that this message will allow others to witness the strange and bizarre behavior of Amy’s husband. I have copied and pasted his texts and my assistant’s responses so that anyone reading this can determine why I received a 1 star review from Amy, who states that she never stayed at this property but yet reviewed it when she never saw it or witnessed her husband and his party band friend’s strange, erratic behavior. Mind you,Todd could not figure out that he was sometimes texting me and sometimes texting my assistant, which was extremely alarming because my assistant contacted him to check him in. Our numbers are clearly listed and completely different.Part of the reason we were confused and concerned by his manic behavior. (Todd) If I catch u in my bathroom again I'll call the cops ! assistant: Nobody is in your bathroom? Todd: If I catch u in my bathroom again I'll call the cops ! Todd U must be the owner I assume .? todd: Yes unless the cam . I put in bathroom is not real !! todd: Someone was in my bathroom !! todd: I'm getting a hotel room and when I'm done believe me you will pay !! After my assistant received this text I then received an email from amy complaining about jacuzzi and toilet and suggesting that somebody else other than the guests were using their bathroom because they found a long hair in the shower 4 days after check in. They complained of a long hair in the shower days after checking in, and complained that the toilet never worked when Todd only contacted my assistant two days into their stay about the toilet, then thirty mins later said they fixed it. Its as if she implied nobody used the toilet or shower for three days of their stay, and that it means that somebody other than them accessed their bathroom. I wish I could say more about who and what kind of people stayed at my listing, but all Im left with is manic threats from Todd/a review from Amy, who said she never stayed. I'm baffled!? The back yard was a little hard for our 2 year old because it is very uneven. The neighbor left the outside light on all night so it was shining into the sofa sleeper all night. the location was good and the cottage is cute. We very much enjoyed our time in Venice. Wonderful retreat in the heart of Venice. We arrived with no one to great us, despite the pre-arranged day and time of arrival with the owner 2 weeks prior. I sent several sms to the owner a few hours prior to our arrival, as a reminder, but she was travelling abroad and her mailbox was full :-( Luckily, we met a neighbour who happened to be renting the apartment upstairs and put us in touch with the owners assistant Kaylee who was sweet and very helpful. She gave us the code to the lock-box with the keys, but we entered the apartment to find that the cleaning crew had not come. Kaylee apologised and came over herself to clean the place and give us new (out of the box) bed sheets and towels while we went to dinner. She was still there cleaning at 10pm when we got home and needed to put our kids to bed. If it were not for Kaylee, it would have been a total disaster. We later discovered that the owner had come down with the Novo Virus in Europe. All in all, our stay was fine, but the owner should be more forthcoming with the arrangements. The Breeze "Cottage" is part of an Apartment Complex that consists of an upstairs apartment (where we heard the footsteps of the family above! )and an adjacent single apartment that one can rent along with the 2-bedroom offer of the Breeze Cottage. Since we had not rented the single, it was rented to another couple. So not only was there noise and light from upstairs, there was also nice from behind the ocked door in the hallway next to our bedroom (they had a separate entrance from the back alley). Venice Beach is a one-of-a-kind place where millionaires homes sit between run-down beach shacks on "Walk-Streets", where cars are not aloud. It sounds charming, but the overall look and feel of the area is rundown and trashy and our walk-street was frequented by a mentally ill man with a skin disease who frightened my kids. Needless tos ay, I did not find the lodging suitable for our family with young children, but I should have been better informed about the area. Within 10 blocks in either direction the area improves greatly. First and foremost, the cottage is NOT as big as it looks on the picture. The third bedroom is locked and used as a separate rental. Therefore, I called the property manager the next morning to report the issues in the cottage, she stated to me that the last renters did not have a problem and she did not understand why I had one. Mind you, I was there for 4 days. When day 2 arrived I called again to see if they were going to fix any of the issues and she stated that there were no issues, where do I think I am in a 5 star resort? I stated well are you going to give me a discount she stated NO, I must have came there looking for a discount. It was so much more she stated to me all I could say was WOW so Unprofessional, I am speechless. The only reason I'm giving one star is because of the location!!!!! Ms. Byrnadette di Santo is sooooo..............rude and nasty I hated I had to give her 1 cent! i have been renting vacation properties since 2008 and have never never had a guest as insane as desarae. desarae reminds me of donald trump. i think she must be related for her tantrums, paranoia and bullying is similar. there is nothing one can do to please an unhappy person who hates life and everyone and everything. before desarae ever arrived at the property she called and emailed non stop complaining about everything from having to leave a vm message to not returning her emails within minutes.??? prior to arriving at the property she was paranoid and already in a panic.?? i think it must have been her very first time renting a house instead of a 5 star hotel and she was expecting 24 hour personal concierge service.??? they said it was working perfectly but would change the filters to get maximum coolness. they were baffled that there was any complaint since the a/c was working and the weather did not warrant use of a/c at all.???? then she called complaining that the door wouldn't close. my assistant rushed over and slid it closed wondering why she was unable to slide a sliding glass door closed??? a few hours later she called saying the tv was broken.. my assistant went over and turned on the tv ( nothing was wrong with the tv) she seemed incapable of turing on a remote by herself.??? finally she called saying that she was taking a bath and the shower wouldn't turn off.?? my assistant went over again and found that she wanted to sit in the bath and run the bath water while sitting in the bath.. my assistant said let me fill your bath and then you may take a bath and she said she had to have water running while sitting in the bath but since she had the bath water on the shower was splashing her..??? my assistant explained to her if she just ran a bath like a regular person and filled the bath there would be no splashing . she had another tantrum and said she was going to write a bad review and that everything was wrong. my assistant then called me really upset for she had gone out of her way to please desarae and found that nothing was good enough..???? ?